For an Oblivion realm, Lord Hircine's plane of The Hunting Grounds, a vast wilderness of forest, meadow, and mountain, is almost familiar to those Tamrielic mortals who find their way there. Almost familiar, but not quite. The March of Sacrifices is a dungeon shaped around the theme of werewolves and Hircine. It is part of the Wolfhunter DLC, along with Moon Hunter Keep. The entrance can be found at a Hircine statue southwest of Serpent's Grotto in Greenshade. The following item sets will drop in the dungeon: Hanu's Compassion, Blood Moon, Haven of Ursus, and Balorgh. March of Sacrifices Objective: Investigate March of Sacrifices. The Great Hunt: Conquer the March of Sacrifices and emerge victorious in the Great Hunt. 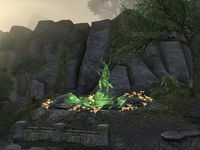 Pledge: March of Sacrifices: Prove you are truly Undaunted by clearing the March of Sacrifices. Following lorebooks can be found inside the dungeon: A Boon for the Tribe, An Unusual Hare, Balorgh's Plan, Concerning Balorgh, Letter to Balorgh, The Glory of the Hunt, and The Huntsman Prince. Throughout the dungeon are three hidden Golden Indrik who, if defeated, will each grant the group a unique boon. These boons offer bonuses that can help overcome the mechanics of later boss battles. In order to find a Golden Indrik, you first need to find three mysterious plants or items dotted around the dungeon. When near the item, you will hear a low, pulsing chime. Activating the mysterious item will spawn a Hunting Wisp. Follow the wisp and it will take you to an opening, which leads to a stealth section. Continue following the wisp and activate the synergy to reveal a Golden Indrik. Once it is defeated, your group will gain the boon. Werewolves gain immunity to Indrik's teleportation magic and can interact with Hunting Wisps. The first boss of this dungeon is a group of three sisters. The primary mechanic in this fight is keeping the three sisters apart from each other and adopting a divide-and-conquer approach. Each sister is surrounded by a colored aura that grants them a unique buff. However the aura also acts as an AoE, meaning the sisters can grant each other their buffs if they are in close proximity. Wyress Rangifer serves as the healer of the group and is surrounded by a yellow aura. Her AoE buff grants increased healing to her nearby sisters. She may also use a healing beam that tethers to her sisters and a ground AoE healing effect. Wyress Strigidae is the archer of the group and is surrounded by a blue aura. Her AoE aura debuffs players with the Silence effect, which blocks magic abilities, ultimates and synergies. Her arsenal includes a channeled Snipe attack which inflicts massive damage unless it is interrupted or blocked. She may also occasionally teleport strike a random player. Wyress Ursus serves as the tank of the group and is surrounded by a green aura. Her AoE buff grants increased resistances to her nearby sisters. Her arsenal includes a channeled heavy attack which inflicts massive damage unless it is interrupted or blocked. She may also occasionally charge at a player, knocking them back and doing moderate damage to them. When one sister is killed, an animal aspect of them will spawn with her aura still in effect. The animal aspects will gravitate towards their closest living sister and grant that sister the buff. The primary mechanic of this fight is a "hunting phase" that is interjected thoughtout the battle. This phase requires the players to break the stealth mode of the boss so it can be attacked. This phase occurs at the start of the battle and when the boss' health percentage falls to 80%, 55% and finally 20%. When first entering the arena, a heavy fog will be flowing all around you and the boss will be completely hidden. The group is required to crouch into stealth mode in order to proceed. Failure to enter stealth mode or having your stealth interrupted by one of the roaming phantom idrik will cause you to teleported into the air, resulting in a short fall the inflicts fall damage. Failure to maintain stealth three times in a single hunting phase will result in a fatal drop. During the hunting phase a friendly wisp will be roaming around the arena. When the wisp lands at a location, it'll emit a green AoE around it. Players must go to that wisp and activate the Synergy prompt. This must be done three times for each phase. The third synergy activation will reveal the boss so that it may be attacked as normal. Every additional hunting phase will result in more varied threats. Stampeding Indrik, frost AoE's, fire projectiles and a frost AOE that spawns on two random players and sticks on them. There are two primary mechanics in this battle. Continually moving the fight between the shallow water and small islands, and overcoming a fog phase where the boss becomes enraged. During the battle, Balorgh's ground slam that will cause poisonous spores to spawn on the three islands, which causes AoE damage and forces the group to move the fight into the water. Balorgh will later activate his lightning attack that will electrify the water, forcing the fight onto the islands. This back-and-forth positioning will persist throughout the fight. Later in the battle, the arena will be covered in a dark swirling fog and a random player will receive a special AoE under their feet. This AoE mark makes them the primary target of the now-enraged Balorgh. A blue pillar of light will spawn somewhere in the arena a few seconds after the initial fog appears. The targeted player must kite the boss through the blue pillar of light in order to dissipate the fog and deactivate Balorgh's enraged mode. During the fog phase, several wolves will spawn. The longer the fog phase lasts, the more wolves will spawn. Of note is that these wolves inflict a powerful and uncleansable snare which can severely slow players down and make it more difficult to reach the blue pillar of light. 5 items: When you resurrect another player while in combat, both you and the player gain Major Heroism for 15 seconds, granting you 3 Ultimate every 1.5 seconds. 5 items: When you take damage while you are under 50% Health, summon Ursus's spirit for 6 seconds at a random group member. You or an ally can activate a synergy on Ursus to grant you a shield that protects you and the activator from 13954 damage for 6 seconds. This effect can occur once every 12 seconds. Wolfhunter Explorer 5 Enter either Moon Hunter Keep or March of Sacrifices for the first time. ​ Wolfhunter Delver 50 Complete Veteran Moon Hunter Keep and Veteran March of Sacrifices. March of Sacrifices Challenger 50 Complete the listed achievements for Veteran March of Sacrifices. March of Sacrifices Conqueror 10 Defeat the Wyrd Sisters, Aghaedh of the Solstice, Dagrund the Bulky, Tarcyr, and Balorgh in Veteran March of Sacrifices. Hircine's Champion 50 Defeat Balorgh after desecrating the Moon Hunter Pack's banner and driving him into a murderous rage in Veteran March of Sacrifices. Survival of the Fittest 50 Defeat all encounters in addition to the Wyrd Sisters, Aghaedh of the Solstice, Dagrund the Bulky, Tarcyr, and Balorgh in Veteran March of Sacrifices without suffering a group member death. Pure Instinct 50 Defeat all encounters in addition to the Wyrd Sisters, Aghaedh of the Solstice, Dagrund the Bulky, Tarcyr, and Balorgh in Veteran March of Sacrifices in under 30 minutes. Timer starts when players jump or teleport into Bloodscent Pass. March of Sacrifices Vanquisher 10 Defeat the Wyrd Sisters, Aghaedh of the Solstice, Dagrund the Bulky, Tarcyr, and Balorgh in March of Sacrifices. The Great Indrik Hunt 5 Complete all three Golden Indrik Hunts and gain their boons within March of Sacrifices. Apex Predator 50 Defeat all encounters in addition to the Wyrd Sisters, Aghaedh of the Solstice, Dagrund the Bulky, Tarcyr, and Balorgh after desecrating the Moon Hunter Pack's Banner in Veteran March of Sacrifices within 30 minutes without suffering a group member death. ​ Seasonal Slaying 5 Defeat Aghaedh of the Solstice while making sure to defeat all of her Lurchers within their primary season in Veteran March of Sacrifices. ​ Light on Your Feet 5 Defeat Dagrund the Bulky while always dodging his Upheaval ability in Veteran March of Sacrifices. ​ Mist Walker 5 Defeat Tarcyr without the indrik teleporting any group members during its Shrouding Mist ability in Veteran March of Sacrifices. ​ Trick and Trap 5 Lead Balorgh into Tharas' Trap 10 times in Veteran March of Sacrifices. Veteran Bloodscent Slayer 10 Defeat 300 Bloodscent Guardians, Bloodscent Archers, Bloodscent Assassins, and Bloodscent Thundermauls in Veteran March of Sacrifices. Veteran Wispmother Slayer 10 Defeat 50 Wispmothers in Veteran March of Sacrifices. ​ Stalwart Sisterhood 10 Defeat the Wyrd Sisters while preventing them from ever using their auras to augment each other in Veteran March of Sacrifices. ​ Element of Surprise 10 Defeat Balorgh while avoiding both Lightning Water and Poison Plants in Veteran March of Sacrifices. ​ Perfect Hunt 10 Defeat Balorgh after desecrating the Moon Hunter Pack's banner and without being hit by his Fire Remnant ability for the duration of the encounter in Veteran March of Sacrifices. This page was last modified on 7 February 2019, at 07:18.